Note that luck plays a role in CWR; however luck plays no role is TWR. CWR is frequently used to estimate TWR, but not necessarily the best estimate. As the number of hands you play increases CWR will approach TWR. This article will explain how to use CWR and variance to find a reasonable range for TWR. While you have an estimate of win rate and a very good estimate of variance you don’t know what distribution your results follow. There are many kinds of distributions with a specified mean and variance. It is very difficult to determine all the possible outcomes of a poker game and their respective probabilities. Fortunately the Central Limit Theorem (CLT) tells us that we don’t need to know all the possible outcomes and their respective probabilities. The CLT says that your results will follow a normal distribution as long as you have played enough hands1. For example, the results of 10 hands do not follow a normal distribution; however, the result of 10,000 hands will follow a normal distribution. A normal distribution has only two parameters: the mean and the variance. That means a normal distribution can be completely described with only mean and variance. It’s important to note that variance converges quickly. That means it does not take long to get an excellent estimate of variance2. (This is unlike the mean, which takes a long time to converge.) For this reason, we can pretend that the variance per 100 we experienced is the same as our true variance per 100. Let’s say your CWR is 2BB/100, SD is 18BB/100 and you’ve played 10,000 hands. What is the confidence interval for your true win rate? Since 0BB/100 lies within the confidence interval it’s possible that your actual win rate is less than 0; it’s also possible that your true win rate is nearly three times what you experienced. These results are important. Someone who has been successful through 10,000 hands may simply be lucky3; someone who has been successful through 1,000,000 hands is certainly skilled. Many players underestimate the luck factor in poker. This causes them to become upset or tilt when they have a poor run of cards. 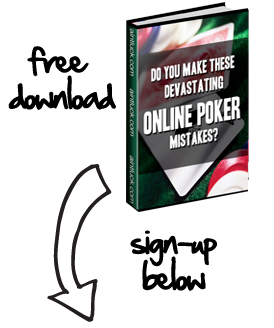 The underlying cause of tilt is a poor understanding of poker. While luck may seem like a bad thing, it’s not. Luck keeps poker from being mastered. If a player’s results were directly correlated to their play anyone could learn to play extremely well inductively (which is how unsuccessful players attempt to learn). Since bad plays sometimes have good results and good plays sometimes have bad results basing your decisions on the results of previous hands is a recipe for many poor decisions. If you’ve ever been told to not be “result oriented” now you know why. 1 This is only true if the hands you play are all at similar stakes. For example, if you play 10,000 hands at 2/4 and 10 hands at 200/400 your results will be dominated by the 10 200/400 hands you played and will not follow a normal distribution. 2 If we could not assume that variance had converged we would use a T distribution, rather than standard normal distribution. 3 This is not to say luck is the only explanation—or even the best explanation, simply that luck is one possible explanation.